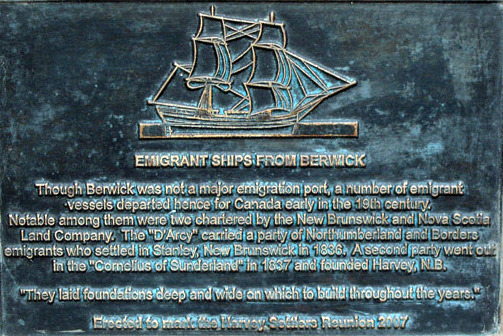 Though Berwick was not a major emigration port, a number of emigrant vessels departed from there for Canada early in the 19th century. Notable among them were two chartered by the New Brunswick and Nova Scotia Land Company. The “D’Arcy” carried a party of Northumberland and Scottish Borders emigrants who settle in Stanley, New Brunswick in 1836. A second party went out in the “Cornelius” of Sunderland in 1837 and founded Harvey in New Brunswick. Erected to mark the Harvey Settlers Reunion 2007. The New Brunswick and Nova Scotia Land Company was formed in 1831 and chartered in 1834 (although it never apparently had any connection with Nova Scotia). Like other similar companies in Canada at that time, they were operating under a colonial administration which encouraged such companies to open up large tracts of land for the purpose of “profit of their colonial shareholders”. The first party of settlers, 110 in number, sailed from Berwick-upon-Tweed in May 1836 aboard the D’Arcy; most were from the lowlands of Scotland, with a small number from the Wooler area of Northumberland in England. They settled in the Stanley settlement of New Brunswick. Both the D’Arcy and the Cornelius in which the settlers sailed to Canada were brand-new ‘brigs’ from Sunderland. Much more on this fascinating story can be found on the dedicated website, The New Brunswick Land Company and the settlement of Stanley and Hamilton. Newsletter No.27. June 2000. p.2. The D’Arcy. Newsletter No.36. September 2002. pp. 17-18. Migration from Glendale to New Brunswick, Canada. Newsletter No.50. April 2006. pp. 18-19. A postscript to the article on the Cornelius (and the Harvey Settlement in New Brunswick). 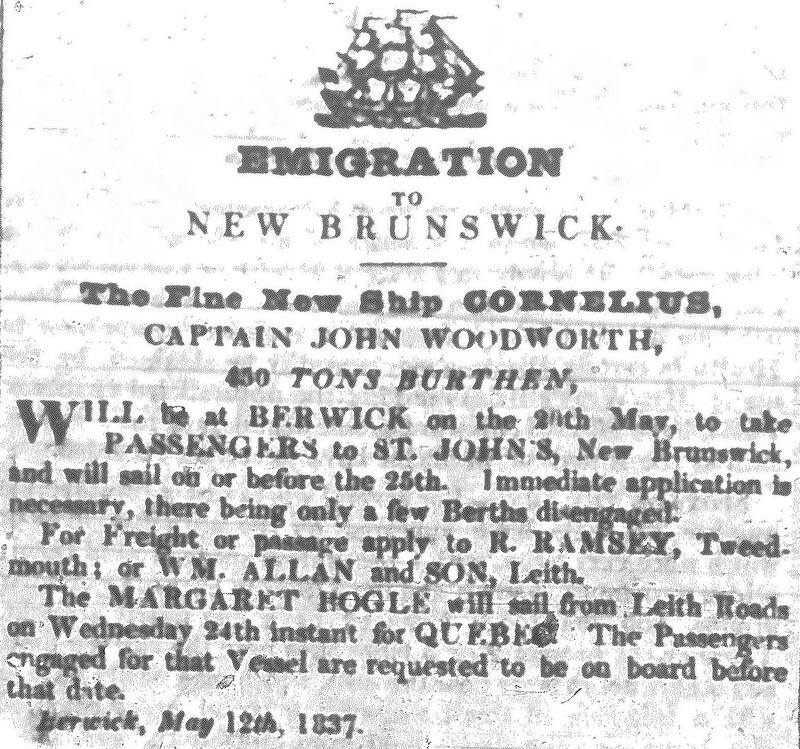 EMIGRATION – To New Brunswick, the fine new ship Cornelius, Captain John Woodworth, 450 tons burthen, will be at Berwick on the 20th May, to take passengers to St John’s, New Brunswick, and will sail on or before the 25th. Immediate application is necessary, there being only a few berths disengaged. For freight or passage only apply to R. Ramsey, Tweedmouth; or W.M. Allan and Son. Leith. The Margaret Hogle will sail from Leith Roads on Wednesday 24th instant for Quebec. The passengers engaged for that vessel are requested to be on board before that date. The New Brunswick Land Company and the settlement of Stanley and Hamilton website.